The revitalized Big Huge Games (formerly SecretNewCo), in partnership with Nexon, has announced the development of the company’s debut mobile title, DomiNations. The studio, founded by 23-year industry veteran Brian Reynolds, is a reincarnation of the original Big Huge Games (itself formed in 2000), which saw Reynolds and his team creating Rise of Nations and Rise of Legends, prior to the studio’s closure in 2012. DomiNations is described as an “epic, strategic combat game” which focuses more on advancement through time and exploration than other titles in the genre. 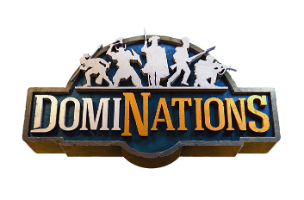 In development for Android and iOS devices, DomiNations will see players choosing to lead one of seven great nations (including Egypt, Greece, Japan, China and Great Britain) from the Stone Age to the Space Age by collecting resources, building an army and researching advancements. In our recent chat with Reynolds and DomiNations project lead Tim Train, we learned the choice players make in which nation to lead will affect gameplay in more than just a visual sense, as each one is being developed to “thematically play” on what the civilizations really did in the real world, and with an “under-the-hood” play style associated with that theme. Plus, each culture starts with an extra stat or advancement not available to the others. The Japanese culture, for instance, is being designed to correlate with the country’s history of long periods of military peacetime. As such, the in-game Japanese nation might be the perfect choice for a player who is more interested in their country’s own personal advancement than attacking other players. To be specific, those who back Japan within DomiNations will receive longer peace treaties and heavier defenses, and will even begin the game with an extra defensive item in their kingdom. As another example, China is recommended for players that want their nation to receive lots of advancement really quickly. In this case, the starting bonus is an extra citizen for each home that’s constructed, which can then be sent to complete more actions at once. Those players who choose Great Britain receive the Long Bowmen as a troop type, while players who choose Greece can construct buildings more quickly, and so on. The overall gameplay of DomiNations will see players gathering resources to build homes and other structures, with the goal of advancing their civilization through time. As players move through the “ages,” like the Stone Age, Bronze Age, Medieval Age, Gunpowder Age and more, the game becomes increasingly complex, with the introduction of advanced economies and other opportunities for players. Reynolds tells us the game will start out as a fairly easy experience, but becomes more complex over time. Transitioning from one age to the next isn’t automatic. Instead, players will need to “research” these ages, with the actual transition points being large, epic events in the game that can change the look and even the function of each kingdom. For instance, when moving from the Stone Age to the Bronze Age, new economic opportunities unlock for players. That is, they may move from a hunting and gathering-based economy to one focused on agricultural advancement or trade caravans. Each new age unlocks new defensive and offensive capabilities and weapons, as well as new world Wonders. This may include archers being upgraded to guns, as one example, but players can also manually upgrade buildings even more. Each Wonder, like the Great Pyramids or the Colossus, has its own effect on the game, and players are allowed to only build one Wonder per age. Since each Wonder has a unique effect on gameplay, users will need to strategically decide which to build, based on the effect they’d like to have going forward.